Armed Forces of the Philippines suffers 14 casualties in 2-week Christmas offensive | Fight Back! Red fighters of the New People"s Army. spoiling the peace and holiday preparations of the residents in the community. 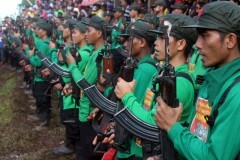 Also, they have doused on the high hopes of their foot soldiers to have a brief respite during the holidays to be with their families,” said the CPP. Going on active defense posture, local NPA units in the area carried out guerrilla strikes resulting in at least four encounters with operating troops of AFP over the past few days. On December 6, an encounter broke out in Barangay Minalwang, while the three other encounters happened in Barangay Mahagwa on December 7, 8 and 13.